Composed of thousands of inlaid chips in over 250 vibrant colors, Marc Chagall&apos;s beloved mosaic, The Four Seasons, was created for and given as a gift to the people of Chicago. It stands as one of our city&apos;s most beloved public art treasures. The French Consul General of Chicago at the time of dedication summed up the lyrical masterpiece best when he said "It is a work of art, but it is first a gift and a feast — a feast from that great citizen of the world, Marc Chagall." Made in Chagall&apos;s studio in France, stones from around the world were gathered to bring the artist&apos;s bright vision to life: marbles from Italy and Belgium, granites from Brittany and Norway, green stones from the Mines of Solomon in the Sinai, stained glass from Paris and Venice, and pieces of Chicago brick. The 128 panels were sent to Chicago by air and sea and two craftsmen, Michel Tharin and Alain Devy, an Illinois Institute of Technology graduate, spent months joining and installing them outdoors in Chase Tower Plaza. Chagall oversaw the finalization of the mosaic, and was present when it was dedicated to the people of Chicago on September 27, 1974. Six scenes wrapped around four sides of a 70 feet (21 m) long, 14 feet (4.3 m) high, 10 feet (3.0 m) wide rectangular box portray Chicago in every season. In the winter scene, a mother lovingly holds a toddler on her lap. In the spring, a serenaded young girl dances joyously. In the summer, picnicking Chicagoans celebrate the sunshine. The harvest is gracefully gathered in autumn. Chicago motifs appear throughout the mosaic: a cow recalls the stockyards and a Ferris wheel evokes the spinning centerpiece of the 1893 World&apos;s Columbian Exposition. When asked why he chose the four seasons as his theme, the 87-year-old artist replied: "In my mind, the four seasons represent human life, both physical and spiritual, at its different stages." Granite benches surround the mosaic, so you can sit down and enjoy a lunch date with Marc Chagall&apos;s vision of Chicago. Grab a lunch to go from Rosebud Express, just across the street at 70 W. Madison Street (the Rosebud Theater District location), where you&apos;ll find on-the-go salads, sandwiches, and signature Italian dishes ready to be carried out to your unique picnic destination. If the season you find yourself in isn&apos;t agreeing weather-wise and you prefer dining indoors, head to the acclaimed Italian Village restaurant, located just nearby at 71 W. Monroe Street. 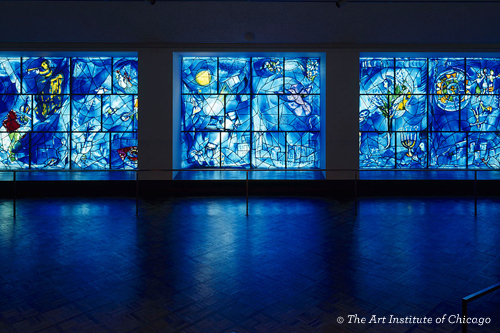 Tip: You can also view yet another Marc Chagall masterpiece at the Art Institute of Chicago, where the artist&apos;s America Windows (1977), a series of large-scale stained-glass panels, honor both the American bicentennial and Mayor Richard J. Daley. Ferris and Sloan share a kiss in front of the inspiring windows in the 1986 film Ferris Bueller&apos;s Day Off. Learn more about masterpieces around the city at cityofchicago.org/publicart. Or check out this public art guide to Grant Park and create your own scavenger hunt for these other famous Chicago public art pieces in The Loop. Marc Chagall, French, b. Belarus, 1887-1985. America Windows, 1977. Stained Glass. 96 x 385 in. (244 x 978 cm) (overall) The Art Institute of Chicago, A gift of Marc Chagall, the City of Chicago, and the Auxiliary Board of The Art Institute of Chicago.